Mortals have five senses, but manitou have more. 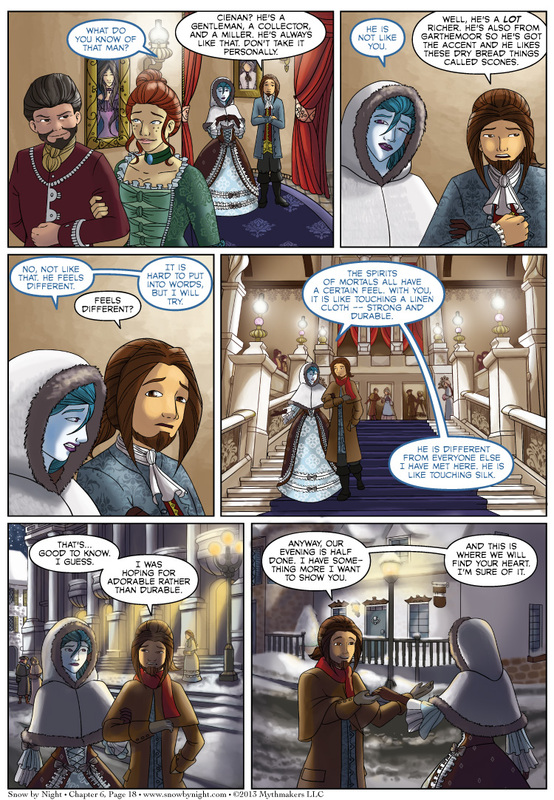 On Chapter 6 Page 18, Snow-by-Night tries to explain to Blaise how mortals feel to her as a spirit. In particular, she tries to explain how Cienan feels to her. To see the Temple of Giavere in all its inked glory, please vote for Snow by Night on Top Web Comics. We won the lottery and got accepted to Otakon’s Artist Alley. This is the biggest show of the year for us so we’re excited to be attending. Okay, he is SO flirting with her. Brings candy, takes her to the opera, then says he was hoping she’d think he was adorable. Here’s hoping they get together soon, even with the problem with kissing. The cover page showed some candles, right? Beautiful as the ceremony they’re going to may be, I worry that the fire’s going to cause trouble for Snow. He is taking her to a chocolate shop?! I suppose a person could find their heart there. Or at least a very pleasant feeling. I read this as “a very pleasant filling”, which is also very likely in a chocolate shop. Does Snow remember her debt with Chugan at this point, and how much time she has left before the big crow shows up? If she ate a scone, with all its moisture-sucking properties, would she evapourate? Such questions have plagued philosophers for centuries. Every time one of your characters hates on the best pastry known to man, it just makes me want to go out and eat a full plate of scones purely out of spite.